To this day, 50-80 percent of the e-waste recyclers out there are simply shoving your old electronics into sea-going shipping containers and sending the material off to China, Vietnam or West Africa. Why? Because the United States is the only country that currently allows this legally. But there are many practical and principled reasons why doing the quick and dirty with your old electronic discards is a very bad idea. 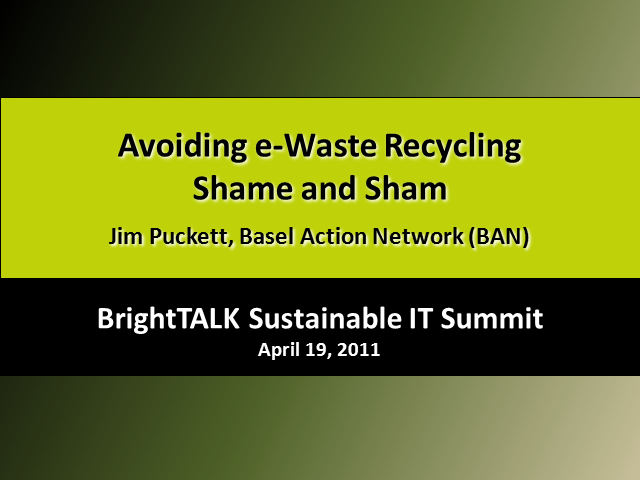 Jim Puckett, Executive Director of the Basel Action Network, will explore those reasons and then offer you a better way. One that has been in the making for 8 years and is now ready for business. One that has been supported by over 70 environmental organizations. One that has been supported by Samsung, Bank of America, Capitol One, Wells Fargo and a growing number of other companies that realize that a toxic footprint is every bit as deadly as a carbon footprint. Responsible businesses finally have a one-stop solution for electronic waste!